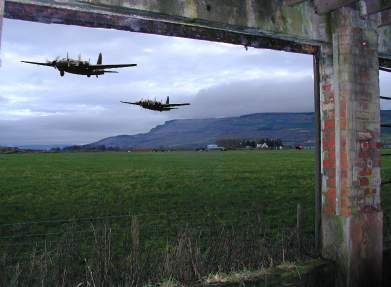 Two Wellington bombers seen from the old control tower. The picture above is a montage, but during the 1940s you could have had a similar view most days of the week. 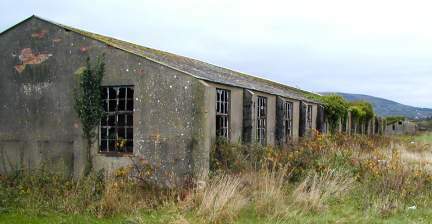 The runways of the old Limavady air base have all but disappeared, but many of the old admin and control buildings can still be seen. If you are interested in the precise history of this place, John Quinn's book "Wings over the Foyle - a history of Limavady airfield in WWII" will give you most of the information you need. I just want to take you on a tour of the place because it is private property and access can only be had with the permission of the owners. 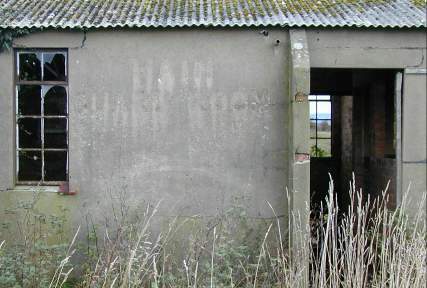 The old airfield is home to a collection of buildings which by now have a rather melancholy aspect and their number is decreasing by the year, as new developments and time take their inevitable toll. It was built at the beginning of the second world war to help protect British shipping from u-boats and surface raiders. Pilots from all over the empire manned the Liberator and later Wellington bombers that were based here and many brave men lost their lives. Benevenagh mountain was a formidable obstacle and hastily built planes flown by hastily trained pilots had no respect for young lives. In fact, reading John's books, it is surprising how few people died as a result of enemy action and how many died in accidents. 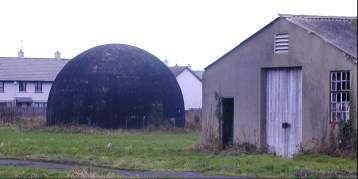 Security was tight during wartime and most people were not allowed to visit the airfield - there was a security barrier as far away as the Drenagh estate. But those who had permission would have entered this building first. Sharp eyed readers may just be able to decipher the writing on the wall: "MAIN GUARD ROOM" it says. It is nice to hear that even with all this security, well known local characters like the late Tommy Houston could enter at will in order to follow their trade. Tommy was plumbing the place and the story goes that the guard who once challenged and stopped him from entering because he didn't recognise him was severely dressed down by the officer in charge on the obvious grounds that everyone living in or around Limavady must know Tommy. Considering how time has passed and memories have faded, certain aspects of the old airfield are surprisingly vivid. War veterans and lovers of old movies will recognise this room instantly. It is in the old command centre. The supervisor would have stood on this podium - currently occupied by some intrepid local explorers. Below would have been large tables where tense and worried men and women moved markers on large tables to indicate the current state of combat in the Western Atlantic. On the walls there would have been large maps showing the current state of the battle of the Atlantic. These tense moments are long gone now and today the bottom of the room - once filled with frenetic activity - is filled with calm, cold water. How times have changed. 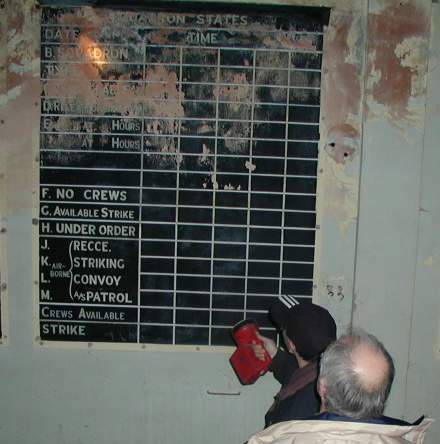 The old operations board is still preserved. Things like the time of sunrise and the phase of the moon - totally unimportant to most people in Limavady these days are faithfully recorded and lives depended on their accuracy. On other blackboards in the large room you can still read the latest chalked entries - a distant memory of very different times. It is well to remember that the people of Limavady were part of those times and that memories of those different days can still be seen. These photographs look well lit. This is because of the flash. In reality the place is in total darkness and we all had to run for it because the failing batteries of our single torch did not bode well for the future. Gladly we come outside and inspect some of the remaining buildings. The large one on the left used to be the fire station. They must have had very long ladders in those days. 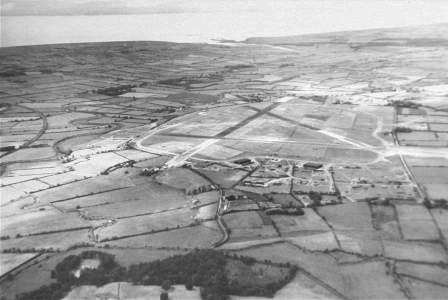 During the latter part of the war the runways of the Limavady airfield proved to be too short for the larger bombers that had been developed. The base became a sort of war-time college and many of the buildings still visible were actually classrooms rather than barracks. 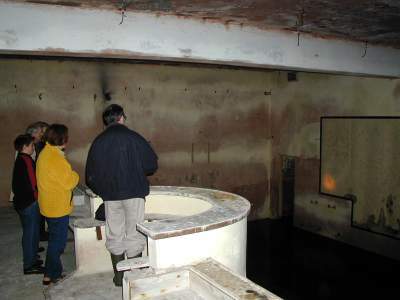 One of the most interesting "classrooms" was the black dome. It is now much vandalised because children use it as a play ground. Originally it was used to train anti aircraft gunners. Inside was mounted a four gun turret and small lights fastened to the black walls imitated the night sky. By switching some of the lights off in sequence, the impression was given that a plane occulted the stars. The trainee gunner was supposed to spot this and fire at the plane. As can be seen from the healthy state of the building, they did not use live ammunition. Because of its shape, the dome produces the most wonderful sound effects. If you stand in certain places you can hear people on the other side of the room whispering. 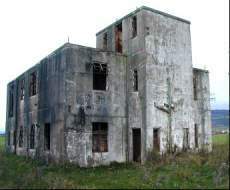 The much vandalised old control tower still stands, though the wooden balcony that used to give a clear view onto returning planes is gone, along with much of the ceiling and floors. The tower has witnessed many crashes. There are still people alive who remember three different planes coming down in one single night and the flames of their destruction burning on the slopes of Benevenagh. The old hangars still survive and are used to store goodness knows what. Only 30 years ago the old runway was used by locals to practise for their driving license, but these days very little of it remains. The area is used as an industrial estate and large firms like Hoechst and Seagate have built factories here. 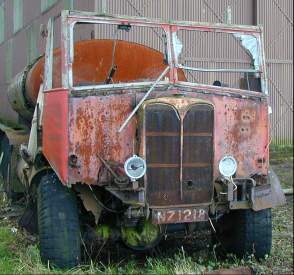 One charming survivor of the old days is this old lorry. At one time it was converted into a tanker and - judging by an old auction ticket stuck to one of its rotting doors - it was once sold to an optimist who didn't bother to collect it. It is much like the old airfield. Full of history but falling to pieces. If there was an interest it could be preserved but without any help it will just fade away. It is well to remember those who stayed behind. Men with as much will to survive as you and me, but ill luck and circumstances beyond their powers took their young lives at the worst of times. Some of their graves are scattered on the hills of Ireland - not far from where they crashed. Some of them are buried in Limavady. Below is a rare photograph from 1942, showing what the airfield looked like then. You can see the Roe mouth in the background and parts of Drenagh estate in the foreground. This is what the airfield looks like now. The three runways can still be made out.